Now you can relive some of the classic video games of the 80s with the Namco TV Games Video Game System. 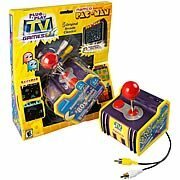 It's so easy to use -- just plug the handheld joystick into your TV or VCR and you're ready to play Pac-Man, Galaxian, Rally-X, DigDug or Bosconian. Requires 4 "AA" alkaline batteries (not included). Namco comes back with the OLD games. I really think that it is one of top 20 or something like that.There are 5 games. 1.Pac Man is a game that everyone should know.One of namcos smash hits in the 80's.In this game you controll a yellow circle and try to collect all the pellets on the stage without geeting hit by a ghost. There are 4 big pellets which make the ghosts destroyable. 2.Galaxian is where you controll a ship and have to shoot all the aliens.Be careful the aliens come down at you to shoot you.So you have to dodge them.If one lands on you,you die as well as the alien who attacked you. 3.Rally-X is where you controll your blue car and get all 10 flags.You have to avoid red cars and rocks.If a red car is on your tail just press the fire button to let out fuel to make them slip.But be aware of your fuel.Letting out fuel to make the red cars slip makes you lose fuel.Running out of fuel makes you lose a life. 4.Dig Dug is where you controll a little red guy to blow up all the enemies. But if the enemies touch you first you lose. 5.Bosconian is where you have to controll a ship and fly in space to destroy all green circled ships.But other enemies try to stop you by running in to you.You have to shoot them first. Fun but dont be fooled! The version of Pac Man on this little unit isn't the good one you might remember. If you'll hark back to the Pat Benatar days, you'll recall there was a "fake Pac Man" that was released in the 80s. (The Pac Man itself was a little too round, the sound was off...something was amiss, yet many didn't notice. If you were a true afficianado, you noticed). Well, this fake one is the one that's shipped with this unit. And it's just as disappointing as it used to be. It's not the real pac man. Also, the Rally X "radar screen" that was in the lower right in the real game is overlayed on top of the actual driving screen. Not good. GREAT FUN FOR THE WHOLE FAMILY!!!! For such a low price, something has to give. Yes, the games play pretty much like the arcade, but there are some annoying differences which may only matter to die-hard gamers like myself. For a casual or younger gamer, they are probably too minor to matter. The sound seemes to be off -- the music is not as good as I remember. My guess is that they are using fewer simultaneous notes, but that's just a guess. The case is shaped very uncomfortably. The joystick does not do diagonals. This is good for games like Pac Man, but if you look at the photos on the box, you're supposed to be able to go diagonal in Bosconian, but if you can't, it makes the game artificially harder. The video quality is poor. I bought this out of sheer curiousity --- for $20, I figured if I don't like it, it's not a big loss. I was pleasantly surprised. The joystick feels solid in my hand, and the game is a piece of cake to set up (plug into your TV, insert 4 AA batteries, and go). Once you turn on the unit, you can pick from 5 classic games --- Pac-Man, Dig Dug, Galaxian, Rally-X and Bosconian. All games play identically to their arcade counterparts and are a lot of fun. 4 AA batteries last a decent amount of time. I've played maybe 6 hours of games and the batteries are still going. I found this unit to be a more faithful reproduction than the Atari 2600 games, the sound and graphics were identical to the arcade, where the Atari 2600 joystick has incorrect sound and the graphics are a bit off. The only thing that frustrates me is because I'm left-handed it's a bit awkward to use the joystick with my left hand. The reason is the TV connector wires get in the way and the one fire button is positioned for right-handed people. Hooray--the real Pac Man Lives!